Study Description: Crossbred steers of Tennessee origin (n = 352) were used to determine the effects on performance when fed Enogen Feed corn silage with either Enogen Feed corn or control corn at ad libitum intake. 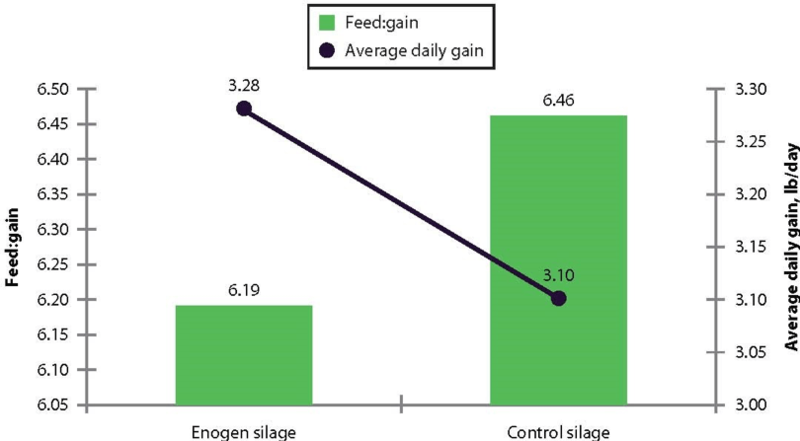 The Bottom Line: When fed in an ad libitum fashion to growing calves, Enogen Feed corn silage improves the efficiency of feed conversion by 4.4% and average daily gain by 6.0%. View full research report by authors M. A. Johnson, T. Spore, S. P. Montgomery, W. R. Hollenbeck, R. N. Wahl, E. D. Watson, and D. A. Blasi at https://newprairiepress.org/kaesrr/vol5/iss1/.